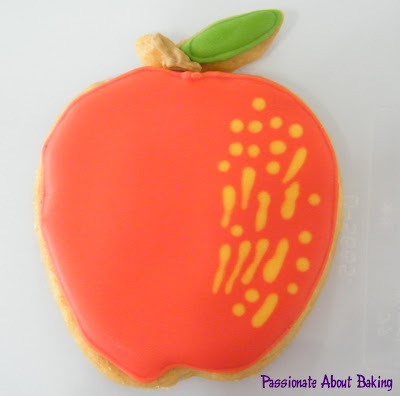 Baking is a form of art. Decorating is another form of art. A chef is no difference from an artist. One puts his/her artistic form into food & presentation, the other put it into paintwork or other kinds of sculpture. I'm not a chef, nor an artist. However, I'd like to be an artistic chef! Hehee... 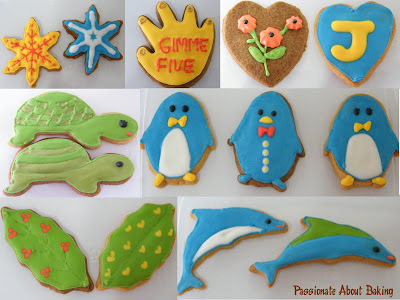 I did some decorating on the cookies which I baked lately, hopefully to generate some interest in cookie art. I hope that will tempt you to sign up for the course which I'll be teaching! It's time to let your imaginations run wild and let your creative juice flow! Baking has become part and parcel of a Saturday activity, unless I have appointment, out of town or other urgent stuff to attend to. I had earlier promised my youngest son to make scrambled eggs for breakfast on Saturday morning. 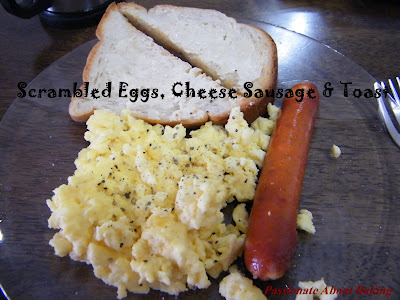 To make it more wholesome, I made (almost) exactly what was sold in Hans breakfast set - scrambled eggs, cheese sausage and toast. I thought it wasn't that easy to make good scrambled eggs, at least to me. I've made them before, and it didn't taste like one. *yucks* He has been bugging us to bring him to Hans for the scrambled egg breakfast. So I thought I might as well make for him! I searched for an easy to make recipe for scrambled eggs. It didn't take long to find one. This recipe from allrecipes was really good. I followed it and it turned out really good. I used 14 eggs for my family of 6! I used cheese sausage, and toasted white bread and spread them with margarine. The breakfast set was really sumptuous and nutritious! I was glad they love it! After breakfast, I wasn't ready to just sit around. 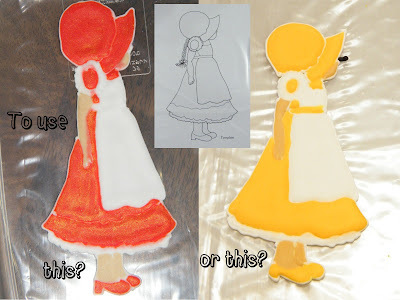 I browsed through the recipe on chiffons and decided that I should practice my chiffon method again. I have no banana nor blueberries on hand. 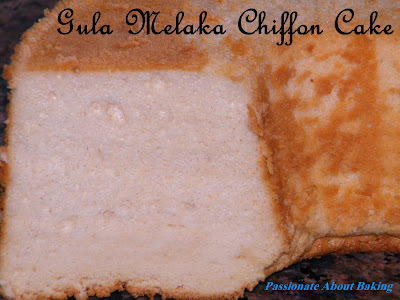 Finally, I settled on the Gula Melaka Chiffon cake. This chiffon was easy to manage. Nothing fanciful, just gula melaka with coconut milk. I think the most important ingredient is to get good gula melaka (palm sugar) to give the cake a nice coconut fragrance! 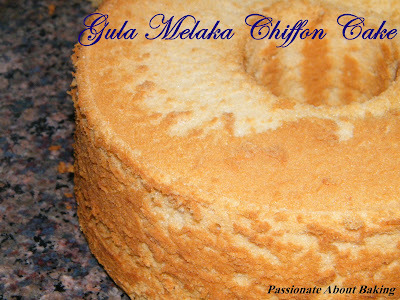 When the cake was baking in the oven, the gula melaka aroma was very strong. However, after baking, the fragrant seemed to have evaporated with the heat too! I brought the cake over to my parents place for them. My dad frowned when I told them I made the chiffon cake. He took a small piece initially, and commented that it was nice. After that, he took another piece. Need I say more? 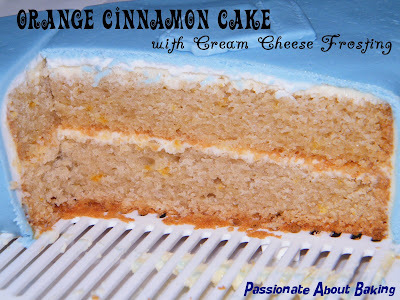 Here is the recipe, extracted from "Chiffon Cake is Done" by Kevin Chai. 1. To make egg yolk batter, melt the gula melaka and coconut milk over low heat. Remove and pour in a mixing bowl, leave to cool. 2. Combine with egg yolks, cooking oil and salt. Fold in flour until it forms batter. 5. Gently fold beaten egg white foam into egg yolk batter until blended. 6. Pour batter into ungreased 9" (22cm) tube pan. Bake in preheated oven at 170C (150C fan oven) for 45mins or until cooked. 7. 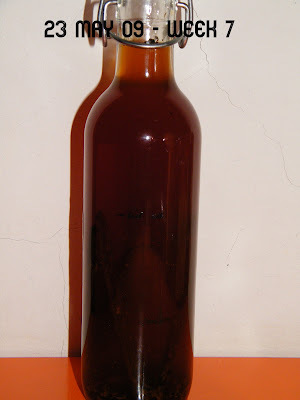 Remove from oven, invert cake on top of a bottle until completely cooled. 1. In a large bowl, whisk together the eggs, mayonnaise and water using a whisk. 2. Melt margarine in a pan over low heat. 3. Pour in the eggs, and stir constantly as they cook. I used a whisk to stir round the pan. Cheese can be added at this juncture. 4. Remove the eggs to a plate when they are set, but still moist. Do not over cook. 5. Add salt and pepper only when eggs are on plate. Ketchup or chilli sauce also goes very well with scrambled eggs. Enjoy! Ever since I've started on some "pro" baking, I've not baked those simple and good treats - muffins! 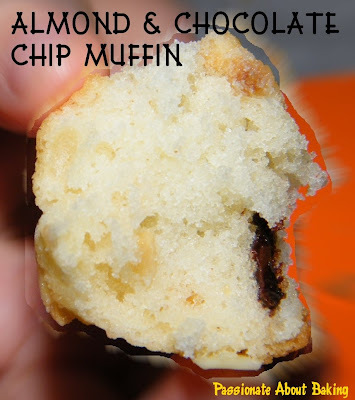 Muffins are actually very simple, doesn't need a mixer, just use whisk or spatula. I wasn't bothered with muffins all these while because I wanted very much to use my Kenwood mixer! Since I've already gotten myself some good and expensive mixer, might as well make use of it right? Hahaa... That was when, muffins are long forgotten. 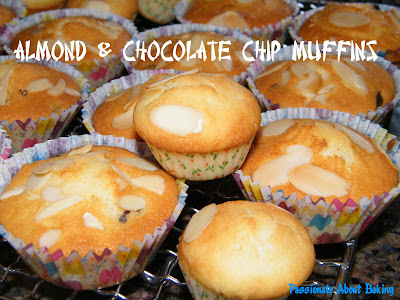 Thanks to Anna for sharing her muffin recipe with me, I thought I might as well go easy with baking on a weekday. I tried baking an almond and chocolate chip muffins. 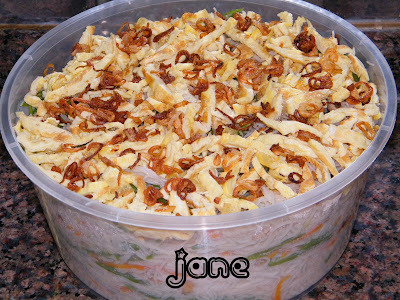 It was really easy, and it turned out to be very fragrant and yummy! I used to love muffins a lot, but have forsake it for cupcakes. Suddenly, I realised I've fallen in love with muffins again! It's just a simple and good treat to bake and eat!! 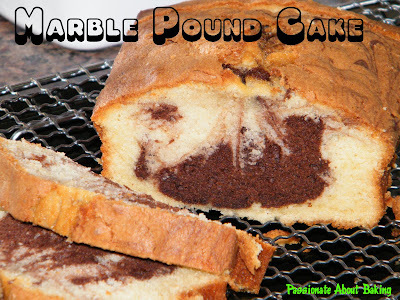 It's got to be pound cake again! I've been trying out new recipes and baking new food now and then. Somehow, I just can't run away from baking some simple recipes again and again. There are some recipes which I just swear by! One of those had to be pound cakes and butter cakes! As my sour cream was expiring soon, I just had to use them, and try to use up all of them. 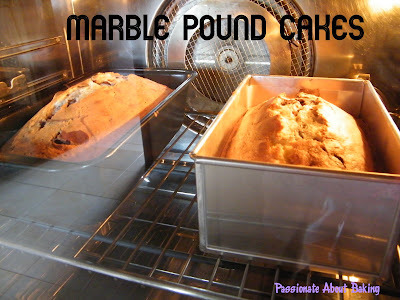 So, the only cake that I can bake, is pound cakes. I baked two loaves, one for my colleagues tomorrow, and the other for my family. 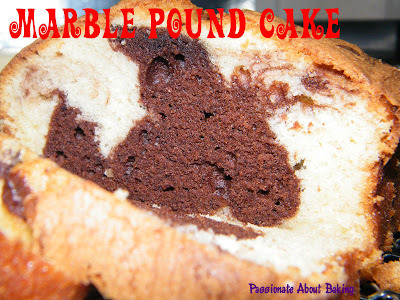 I baked the marbled pound cakes instead of the usual chocolate only or vanilla only. 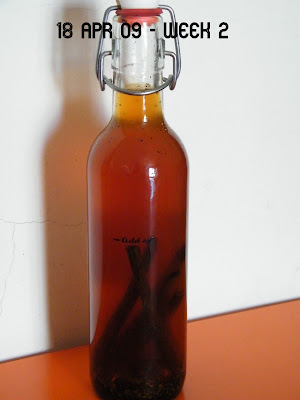 Then of course, I used my homemade vanilla extract. 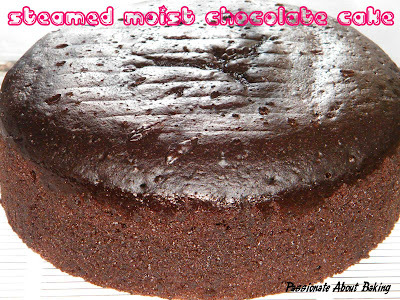 There were quite a number of raves about the steamed moist chocolate cake from Peng's Kitchen. One was from SSB, and the other from a colleague. When I saw how beautiful it was, I was tempted to try this also. 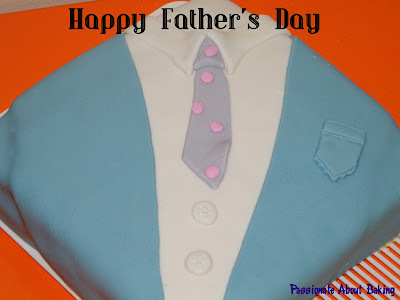 I did it as a Father's Day cake for my father-in-law. 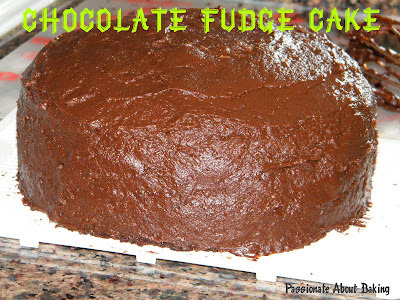 I frosted the cake with chocolate fudge. The overall taste and texture was really good. It's really worth making. 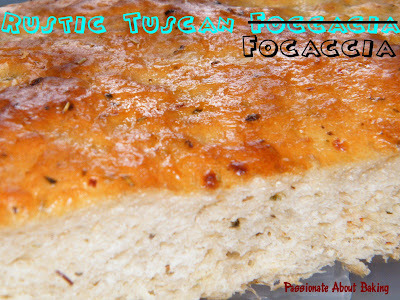 On the same day I steamed the cake, I also made a focaccia bread. My colleague gave me a jar of Rustic Tuscan Seasoning that she had bought from US previously. The seasoning smell very good. It was meant for chicken basically. As I don't roast chicken that often, I've decided it should go into my focaccia. 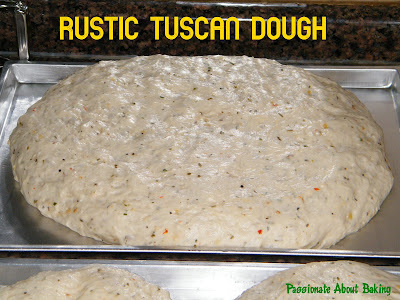 True enough, with this seasoning, the focaccia was extremely extremely good! I've been waiting, waiting to put this up since two months back. But I had to hold myself back until the time is ripe, that is, about now? Since early March when my sister gave me a bunch of Madagascar Vanilla pods, I knew I had to try to "preserve" them as long as possible. I was rather careful and stingy about using them. 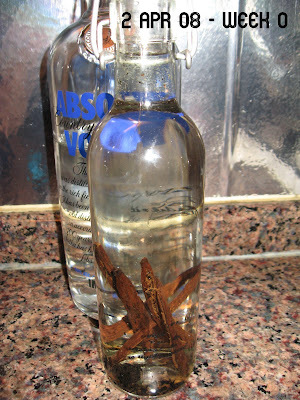 Then I found a way to use them carefully - make vanilla extract! 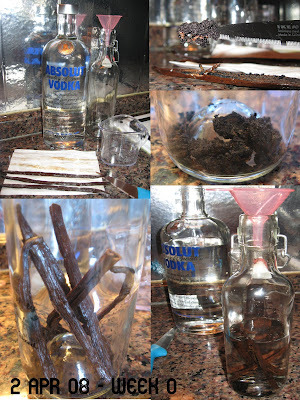 Gina had taught me how to make them into vanilla extract by soaking them into Vodka. 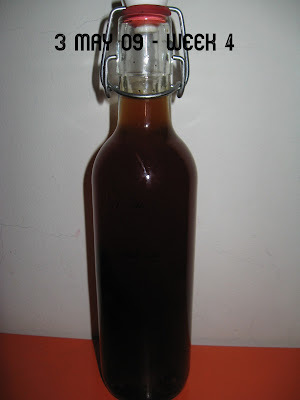 I followed her method closely from Kitchen Capers, and the extract was really good! This was the result of weeks and weeks of shaking and "standing". 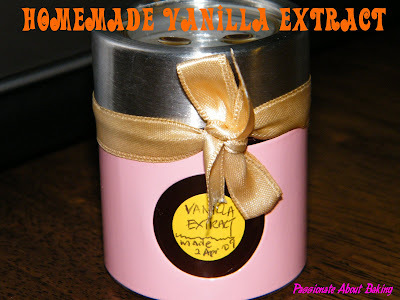 In one of the sites, I read that Vanilla Extracts matured over time, just like wines. That will mean that I can keep them for a long long time without them "expiring", isn't that great? 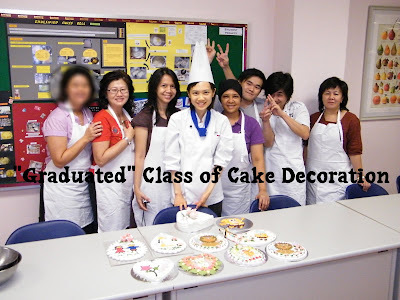 Two months back, I started with the cake decoration course in BITC. For twice a week, eight weeks, rain or shine, happy or sad, energetic or tired, I went to the class. The class was 6.30pm to 10pm on Thursdays and Fridays. 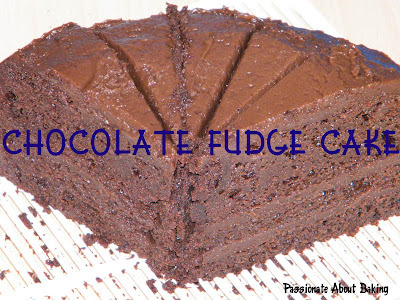 Going to the classes meant forgoning baking cakes during those evenings. It's an opportunity forgone. On 18 Jun, it was the last day of the course. For good or for bad, the seven of us made it through. It was a fun bunch of friends to have and know. For the past three lessons, it was just preparation for the sugar plaque, to be presented as our final project work for this course. 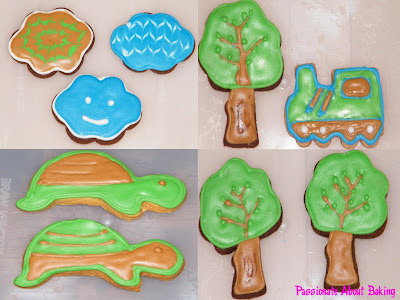 I had to bring back some of the royal icing works to do. It seemed that I did very little preparation and planning. :( Got a bit panicky in class while I was assembling my decorations. I was the last to finish my sugar plaque as most of them knew what to do, while I didn't. :( It was a relief to have completed the plaque. Ideas were given to us earlier on how and what to do. 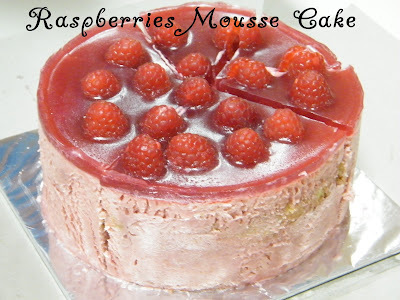 A coursemate, Margaret, made a Raspberry Mousse cake as a graduation celebration for us. She feeds us with her bakes quite often. 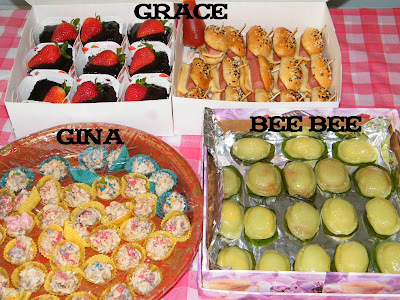 So far, she has made fruit tarts, brownie, chocolate cheesecake, butter cake and lavender lemon cookies. They're like from bakeries! 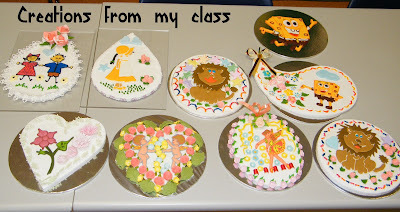 This is the wonderful class of Cake Decoration from BITC. 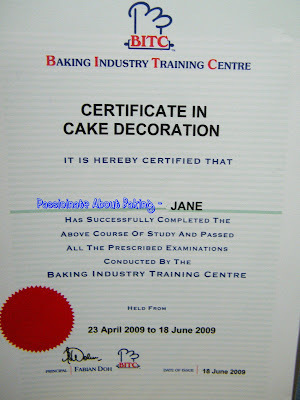 The certificate may be an achievement to some, may be meaningless to others. However, to me, it's just the beginning of the journey to more decorations, practices and endless creativity! I'll be moving on to the Wedding Cake Decoration course. 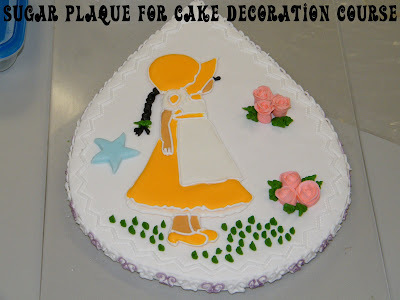 That is why, this is only a preliminary round, it's a pre-requisite to Wedding Cake Decoration. My First Piece of "Art"
Since attending the 2-tier cake at Anna's workshop a month ago, I've been dying to try out a fondant cake myself. 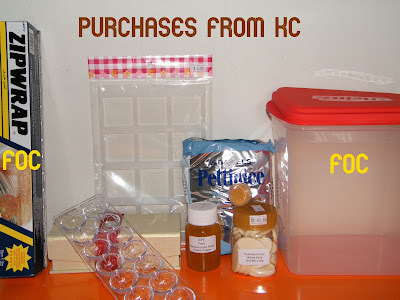 I brought back all the leftovers from her workshop as she said we can keep the unused in an air-tight container and put them in the fridge. Nevertheless, my family was rather impressed with my first fondant piece. Though the works is so-so, but from far, it still looks alright, at least to them and myself (self comforting)! The only complaints they had were, the fondant was too sweet! They didn't like the fondant, but like the cake though. 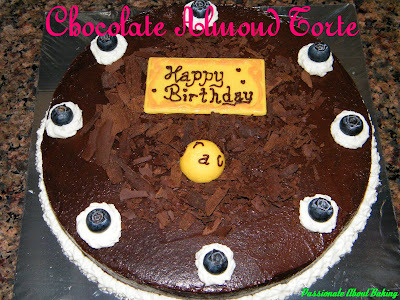 Earlier this week, I made a Chocolate Almond Torte for a friend. She ordered it for her own birthday. Her family and her like the cake very much although it was really rich. 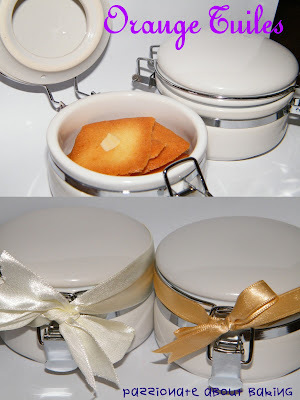 I made some tuiles for her and another friend as a birthday gift. I'm glad that they like it. It was a few days', a few meals of celebrations. 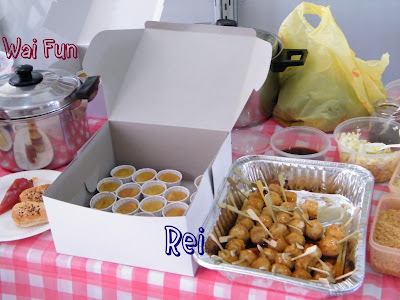 My parents and sisters celebrated my birthday with a long-promised-promotion treat from my youngest sister. 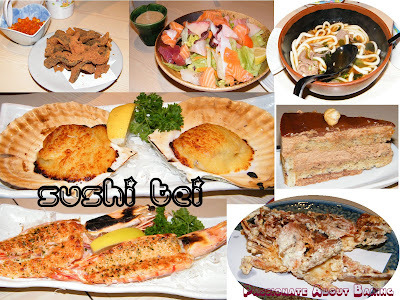 We had dinner at Sushi-Tei. It was really sumptuous!! She was really really generous in ordering all the good food. Yummy! Thank you Christy! The other sister bought two cakes for me. 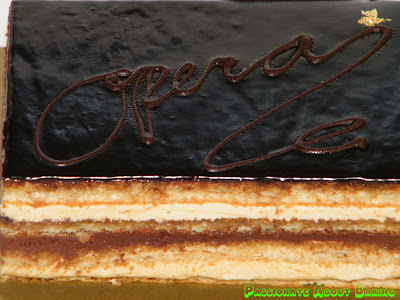 One is an Opera Cake which I got to bring home, and the other was a Hazelnut cake with crispy layer to share with them. It was an evening of glutton! They were very kind to tell me that for my birthday, I should not be baking a cake, and rather, they will buy a cake for me! :) Thank you Irene! 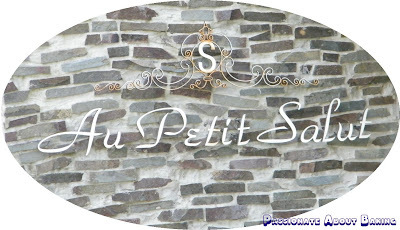 I told him I wanted to try French cuisine and so, he agreed that we should go to Au Petit Salut for a little indulgence. Both of us ordered the $58+++ set menu, as we preferred the food for this menu. 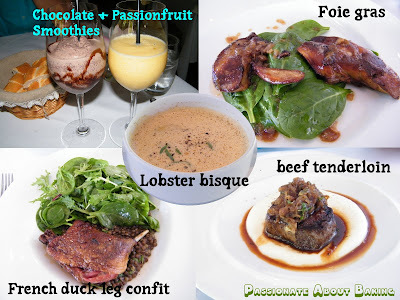 It was the first time I tried foie gras. Okay, I'm rather "swaku" I know, which is why I wanted to try. My main course was duck leg confit. It's something my elder sister had done for us previously and I like it. My hubby had the lobster bisque and beef tenderloin. The beef tenderloin was really good, and was surrounded by very fine mashed potatoes! 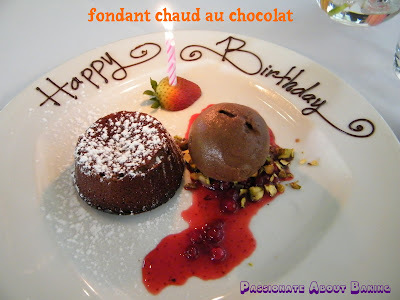 Finally, for the dessert, it was presented in a very lovely and thoughtful way! My husband had called earlier to request for a cake for my birthday. However, they informed him that they don't have cake in the restaurant and he just let it pass. He was also pleasantly surprised by the beautiful presentation! It was really a very wonderful dining experience to remember. We were quite surprised that on a Monday lunch, the place was packed!!! It just goes to show how good this place is then! As for dinner, we brought our family to Swensen's and invited my 3rd sister to join us. I managed to get myself a complimentary Firehouse after our dinner. Doesn't everyone do that for their birthdays in Swensens? Hahaha... I'm a bit cheap skate. 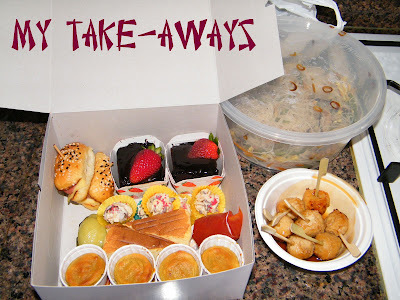 My hubby commented, for lunch for both of us, we spent about $140, for dinner for a total of 10 persons, we spent about $120! What a vast difference! :) I think it's the total dining experience that counts, don't you? Two weeks ago, I tried to persuade my sister to let me bake my nephew's birthday cake for his birthday celebration in school. I finally got her to agree. :p Why did I have to persuade her? Mainly because my cake baking and decorating was still not up to standard. So I ask her to let me try, so that I can practice. After much persuasion from her to my nephew, he finally agreed to have just a simple design cake-Star Wars letterings. 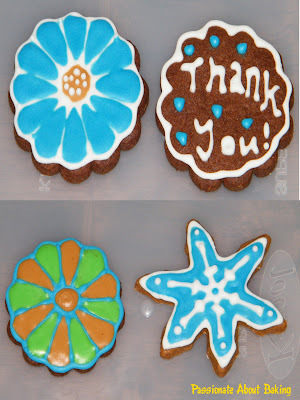 They sent me the letterings and I based on it to do a chocolate transfers letterings. 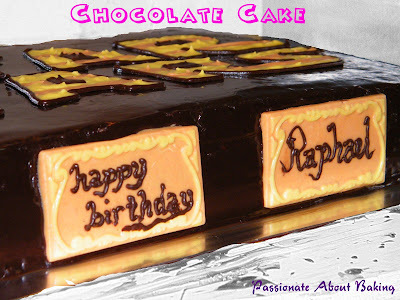 I did a "trial" chocolate cake on 30 May for the design. 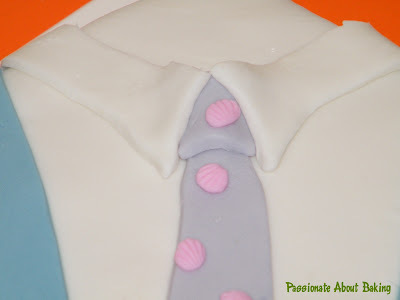 Fortunately, he liked the design, though, not that much of the cake. The following week, I started again by making the chocolate design, followed by baking the cake, and finally on Wednesday evening, I quickly assembled the cake. I prepared everything the day before, so I just need to quickly assembled them on Wednesday and delivered it over to them on that evening. Fortunately, I was able to complete the cake and delivered to them by 10pm. 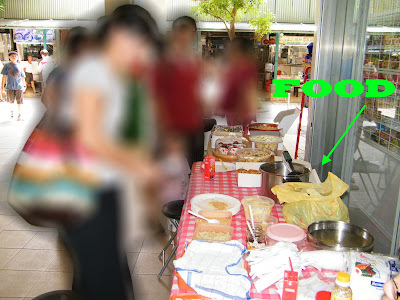 Despite my preparation, and having prepared the stuff days before, the cake wasn't really that ideal. 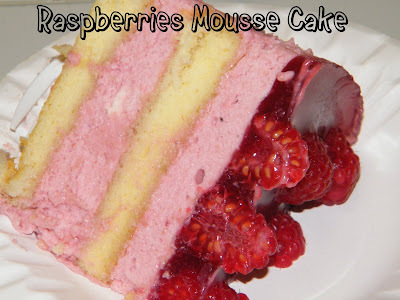 Firstly, I used an emulsified cake, which they said was too dense and soft. Secondly, between each layer was just chocolate ganache and chocolate rice, the cakes fell apart once it cut. Likely hood was because my ganache was too thin? Thirdly, the corners of the cake was not levelled. I hope they were not too embarrassed by all these "faults". I was glad I was given the opportunity to "practice". Based on all these feedbacks, I shall attempt to try and improve my cake frosting skills again. Buck up! Never give up! It was a terrible week. There were so many things to be done, and I was on course. I really couldn't find the time to do my own bakings, and update posts. 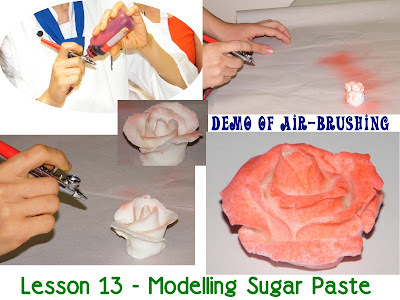 This week's lessons were on using different types of sugar paste for modelling. 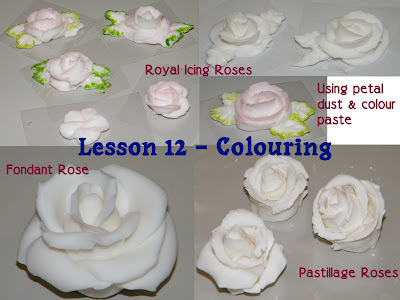 We did our roses using Royal Icing again on lesson 12. This time, we added colours to our rose using petal dust. It adds depth and dimension to the true white royal icing. We did the leaves on the roses, but colour it using normal colour paste. We also tried making rose using fondant. Using fondant to make rose is not that easy as fondant is really soft. For lesson 13, we did a recipe for Pastillage. Pastillage is much harder, and dries up very fast. It's more difficult to make roses using that. Amy showed us air-brushing although it was not in our curriculum. Air-brushing is in, while other ways of colouring are not in trend. It's interesting how new trends unfolds in cake industry and make-up industry! Guess human beings and cakes are alike - they need some make up to look presentable! It was the day we have been waiting for! That afternoon was hot. As I brought my bee hoon to Kitchen Capers, I can't help but feeling really nervous and excited. It's like a little girl, wanting to show her wonderful work to her parents. Hahaha... 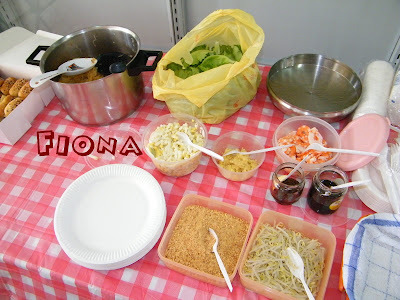 This was the first food bloggers potluck party. Gina was really nice to let us "mess up" her shopfront, got us a few tables and chairs, and sponsored all the disposable cockeries. Besides that, her daughter, Melody was also happily helping us with the setup. As I was early, I had the privilege to reece her shop first, and picked up the items that I wanted. As the clock ticked on, more blogger friends came. I had known Grace and Adeline before, so I had no problem recognising them. One by one came with their food, and we set them on the table. We introduced ourselves to one another, chatted a little first as I think we were still quite shy. As the afternoon heat heats up, so was our heart. We were then happily eating and chatting away. 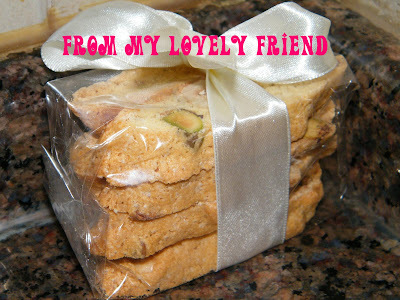 The food that all my bloggers friends brought were really wonderful! 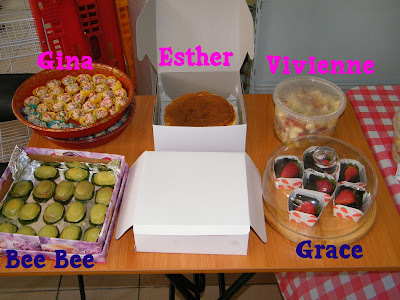 I could not believe the trouble that they have really gone through to make them, and support this little potluck party! After we had our fill (and still left quite a lot of food! 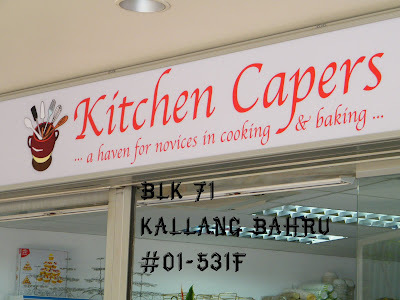 ), we went for a little tour at Kitchen Capers, with our host, Gina, explaining the rational of the items that she brought in to sell at her shop. All of us were rather happy to be in her shop as we walked out with loads of stuff (almost)! 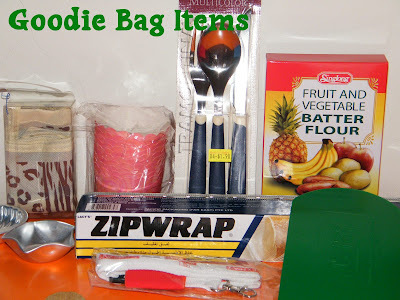 She was also very kind to sponsor us some stuff from her shop as goodie bag.